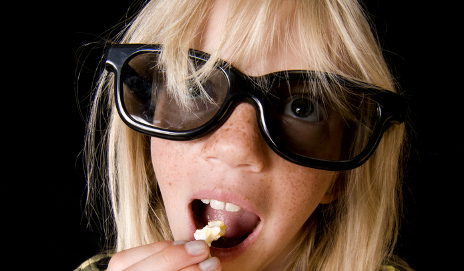 Are glasses putting you off 3D TV? The march of the 3D TVs is well under way, even though the majority of the votes in our poll suggest that we’re not interested in the technology. It looks like the required glasses may be the sticking point. So far in our poll over half of you won’t be buying a 3D TV. A quarter of you claim you’re likely to buy one in the next five years, with 9% within two years, and 12% in the next 12 months. Although the jury’s still out on this – please go and have your say in the poll – it doesn’t look like many of you are interested in watching your telly in three-dimensions. And one of those limiting factors, as argued by Mike Briggs in his Convo against 3D tech, is the need for 3D glasses. Having to wear bulky shutter-glasses, which currently cost a small fortune, are apparently holding us back. In a study by The Nielsen Company, 57% of people surveyed said the required glasses were the reason they wouldn’t buy a 3D set. And many of you agreed in your comments on our previous 3D TV articles. Chad declared that “3D is a gimmick and until it’s glasses free it will stay a gimmick”. Terfar added that he “cannot see users wearing glasses to watch 3D TV”. As a glasses wearer, Michael Bates felt that “the addition of any glasses worn over the top of [his] own makes for a very uncomfortable and distracting experience”. Unsurprisingly, in this age of multiple gadget handling, nearly nine in ten people felt that the glasses would constrain them from multitasking while they watch TV. Other concerns include the lack of content, either broadcast or on disc, since there are still only five true 3D Blu-rays on sale in the UK. But unsurprisingly, it’s the tech-savvy gamers who’re likely to jump on to the 3D band wagon. Seven in ten gamers told Neilsen they were interested in playing games in 3D. With 3D gaming already on Sony’s PlayStation 3, gaming could very well be the deciding factor in the technology’s success, just as the console had a hand in Blu-ray’s victory. So where do these results leave 3D TV? It looks like the technology certainly has the potential to take off in a big way, but it’s unlikely to explode until glasses-free TVs go mainstream. When will you buy a 3D TV? The Nintendo 3DS will certainly grow the appetite for glasses-free technology and some TVs are already being prototyped. But it’s not great…yet. I would be interested to know when (or even, if) 3D will go glasses free. I think it’s a bit of a non-debate really – like asking whether using a steering wheel puts you off driving a car! 3D TV currently is used exclusively for showpiece broadcasts/films so i dont think multi-tasking either is an issue – why spend so much money on the TV & glasses and then also try doing the ironing at the same time? That said I do like 3D and it absolutely adds a lot to football and films (assuming, especially in the former example), that watching conditions are good as this is likely to be in the pub. Will I be buying a 3D TV in the short term? Probably not – 3D has been around for 50+ years and frankly in it’s current state I think it’s a bit of a flash in the pan. The Queen’s coronation was filmed in 3D in 1953 and it’s only advances in technology in the film industry recently that has caused the boom in it’s use. Lombear is right that early adoption, certainly at this stage, I feel is likely to leave you feeling out of pocket in a few years time. Erm – i tried to type “glasses free” above and it starred me! Thanks Chris – surprisingly it didn’t star you out the second time. We’re aware of the issue and are making efforts to fix it. I said 12months, but you have to realize, nearly all high-end LCD models are 3d capable and have been since CES 2010… So I’m pretty sure many people will be getting 3d by default — just like many people have TVs capable of using ‘gadgets’ nowadays but probalby also said “never” in a poll like this. My 73″ Mitsubishi DLP WD-73833 was 3D ready two years ago, it was a spec I had to have on my last big screen purchase. Just waiting on Killzone 3 to release on PS3 before I go out and buy Xpand 3D glasses, I want 3D glasses with a rechargeable battery rather than a propiertary one like the ones today. I will buy two pairs, but agree for a family of four it is expensive but that is what the movie theater is for, my 3D will be for gaming mainly. As said by you and Roger, many TVs already have the capability of showing 3D programmes, Blu-rays and games. It’s mainly about the refresh rate, so all you’ll need are the glasses and adjoining receiver. So in the future most of us will have the tech in our homes whether we knew it or not – though this won’t be the case when the expected ‘glasses-free’ TVs launch. Actually the price is the one putting me off. I watched many 3D movies in cinemas before, although putting another set of glasses on my own is a bother but once you have adjusted, you won’t feel bothered at all. I just wish they make clip on glasses for those with people with correctional glasses. But seeing how Sony and other companies started working on making glass free 3DTVs, I guess waiting for another 5 years before I can enjoy 3D movies and gaming won’t be too late. It’s just the same as HDTV before. I waited until the prices dropped until I bought one, was I too late? Heck no. I enjoyed it more now since I got to buy a full HD capable 1080p HDTV. I already own a 3D monitor for gaming. It’s great because games don’t need special support to work in 3D, so almost any full-screen 3D game you care to run work great. The glasses can be a mild pain because they make the image darker, so I prefer to play with the lights off. That aside, I love it. You can also adjust the 3D separation setting for your comfort. My issue is that I bought a hi-spec AV receiver only about 9 months ago but it is not able to pass through 3D images via HDMI and there is (currently, at least) no firmware upgrade to alter that. So I would have to connect any 3D hardware direct to my TV to get the image … but I only have 2 x HDMI ports available. So I am already heading in the direction of a connection crisis! It would be good if you could mention somewhere that some benign eye conditions actually make it impossible for some people to see 3D so buying glasses in that case is a complete waste of money! Glasses free 3D technology is already being worked on – but the TV technology isn’t quite ready. It is, however, ready for portable devices, with Nintendo’s next video games handheld (3DS) employing the technology. So you’ll see lots of people playing 3D games on public transport without wearing dark glasses! I went to see the 3D version of Avatar at the cinema and found that I was constantly having to give myself a rest by removing the 3D glasses for a while, so that tells me that a 3D TV is not for me. I unfortunately have a lazy eye and when i have put on my son’s 3D glasses he uses for gaming everything has a pink tinge to it!!!! Don’t know whether all 3D glasses will be the same but I don’t think i’ll take the risk. Your poll doesn’t have sufficient options; I already have a 3D tv and am becoming impatient at the lack of 3D content. That should be satisfied by Christmas though and I an expecting a few blu-ray shaped parcels under the tree this year! Yes, you are right – there is not an option for ‘already owning a 3DTV’. Answering ‘In the next 12 months’ will be sufficient and just caveat it with a comment, as you have. I agree…the content’s not quite there yet. Based on your best buy conclusions and statement in your technology e-mail that you have never seen the picture quality as good as this one (or words to that effect) I am about to buy Samsung UE55C8000 next week. I have seen demonstrations of all the 3D TVs in the market and the one yet to come into the market which is Sony KDL 46HX903 in Harrods. I fully agree with your findings. Nothing impresses me more that this Samsung TV. Toshiba has announced two 3D TVs (12- and 20 inch) that don’t need glasses. Just for Japan at the moment. However, the company concedes that ‘it will take several years to develop larger 3D TVs without glasses with screen sizes of 40 inches at a reasonable price’. It strikes me that ‘Rumbelows’ or whoever are missing a trick here. If people could hire a 3D telly for six months before purchase, I think that would help the manufacturers understand demand. I will not be getting one, I don’t get it at all. Sell the telly. Send your licence back. Go for a nice walk instead. Why does anyone want 3D TV? Watching current 3D films in cinemas show that far from being more ‘realistic’, the experience is in fact more artificial. I have also observed that large portions of the film when viewed without the glasses do not appear to need to be in a 3D format, as it makes little difference. It is in fact only the occasional incident when something is ‘projected’ from the screen that the 3D effect really comes into operation,and this also is more artificial than realistic. For me, the push for 3D TV is just another exampleof manufacturers wanting to persuade consumers to buy yet another thing that they do not really need. I am not averse to new uses of technology where they add something useful to our lives, but I have a button in my car that when pushed will allow me to then speak to the car to change a disc, radio station, use the phone etc, when pushing an alternative button would instantly carry out that activity anyway. What is the sense in that? Rather than work at 3D, perhaps TV manufacturers could concentrate on improving their existing technologies so that images do not occasionally ‘freeze’ or ‘pixillate’ for example. I have a laptop with 3D spec, unimpressed, I rarely use the 3D function as I need spectacles to use the computer, the 3D glasses clip ons are cumbersome and distracting. What I want is Holotv, what is being called true 3D. I worked on this 35 years ago and then we projected it should have started replacing traditional TVs at least 15 years ago. By now you should have a projector which throws a holographic image into your room (no screens), the idea was that the viewers sits around the display much like viewing a play in the round. It seems that the idea now is to project the image outwards from a traditional screen giving you a holographic effect, but you still will not be able to walk around the characters (and still not find out if Sharon Stone was wearing any in basic instinct). Until then the 2D manipulation with glasses is just a gimmick, I would recommend not wasting your money until we get the real thing. I just wish manufactures would stop released half developed products onto the market, but reality means they have to get money from somewhere to fund R&D. I just bought LG passive 3D , so i do’nt have to buy expensive glasses , because I am not so keen about 3D .